PORTLAND, OR - AUGUST 4: Members of the Portland Police stand guard on the SW Corner of Naito Parkway and SW Salmon, separating both sides at the Patriot Prayer Rally in downtown Portland, OR, on August 4, 2018. (Photo by Diego Diaz/Icon Sportswire via Getty Images). 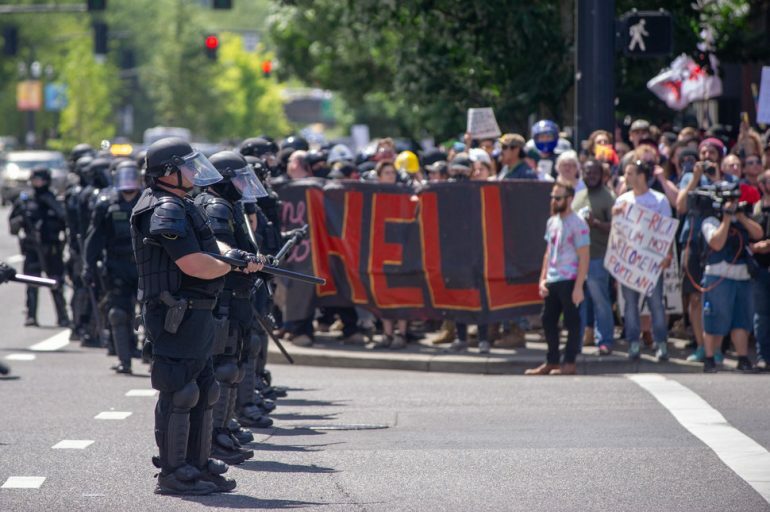 For hours, dozens of officers in full riot gear stood across a closed section of Naito Parkway along the Willamette River, keeping the two sides apart. On one side of the parkway, in Tom McCall Waterfront Park, stood hundreds of out-of-towners belonging to the Proud Boys — a punch-drunk far-right group of self-described “Western chauvinists” dressed in helmets and body armor — and those aligned with Patriot Prayer and its leader Joey Gibson, a Republican Senate candidate from Washington state who has held a series of increasingly violent rallies in the Pacific Northwest since 2017. Both groups have deep ties to white supremacists.